Saturday marks the seventh consecutive day truck drivers across Iran have been on strike, reaching nearly 250 cities across all of the country’s 31 provinces. Bus passenger companies such as Iran Peyma, Hamsafar, TBT and Royal Safar in Ahvaz, Abadan, Khorramshahr, Mahshahr, Izzeh and other cities of Khuzestan Province closed their ticket stores and branches in solidarity with the truck drivers’ protests. A number of transportation companies have also closed down in solidarity with the truckers’ nationwide strike. Truck drivers in the city of Sirjan blocked a road on drivers who loaded goods despite the strike spreading throughout the country. In Zahedan, fruit trucks emptied their loads in the city’s Sarallah Boulevard and joined this strike. They have also announced their support for the truck drivers. A group of bazaar owners in Tehran issued a statement in support of the truck drivers’ strike. On Saturday, September 22, , truck drivers and heavy vehicle drivers their strike across 156 cities in 31 provinces of Iran. They refused to move and load goods; as a result, the main terminals of the country were shut down. This strike followed the general strike of truck and heavy vehicle drivers in May and July this year. Fuel-supplying tanker drivers also joined the strike in some cities like Tabriz, Kerman, Bandar Abbas, and Arak. On Monday, September 23, they continued their strike for the third consecutive day. This protest movement spread to 156 cities in all of Iran’s 31 provinces. Drivers have refused to accept any new loads and have brought all the load stations across the country to a standstill. 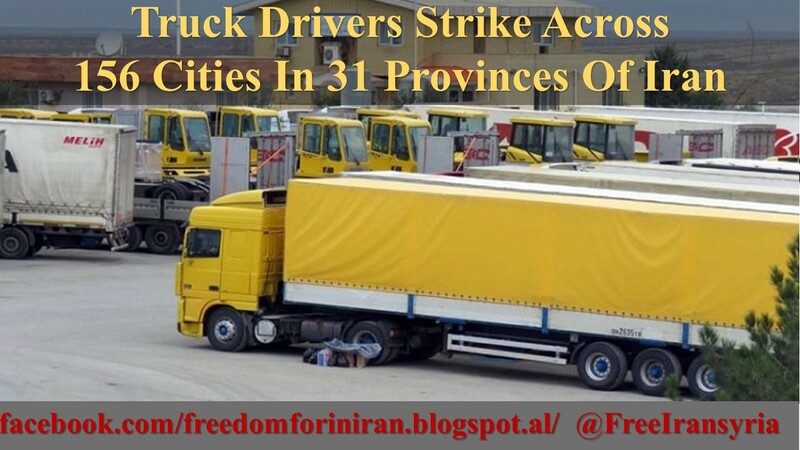 Third day of truck drivers on strike continues in 136 cities across all of Iran's 31 provinces. On Saturday, September 22 across 136 cities in 31 provinces of Iran. They refused to move and load goods; as a result, the main terminals of the country were shut down. This strike followed the general strike of truck and heavy vehicle drivers in May and July this year. Fuel-supplying tanker drivers also joined the strike in some cities like Tabriz, Kerman, Bandar Abbas, Arak. Mrs. Maryam Rajavi, President-elect of the Iranian Resistance, saluted the noble drivers throughout Iran, saying that the mullahs’ regime neither wants nor can respond to their rightful requests. The realization of these demands is possible only with the freedom and sovereignty of the people. She called all the people, especially the youth, to support the strikers. On Wednesday, September 12, the Bazaar merchants and shop owners in various cities of Iran’s western provinces of Kurdistan, Kermanshah and West Azerbaijan went on strike to protest the executions of three Kurdish activists and the missile attacks launched at the headquarters of the Kurdistan Democratic Party and the Kurdistan Democratic Party of Iran. 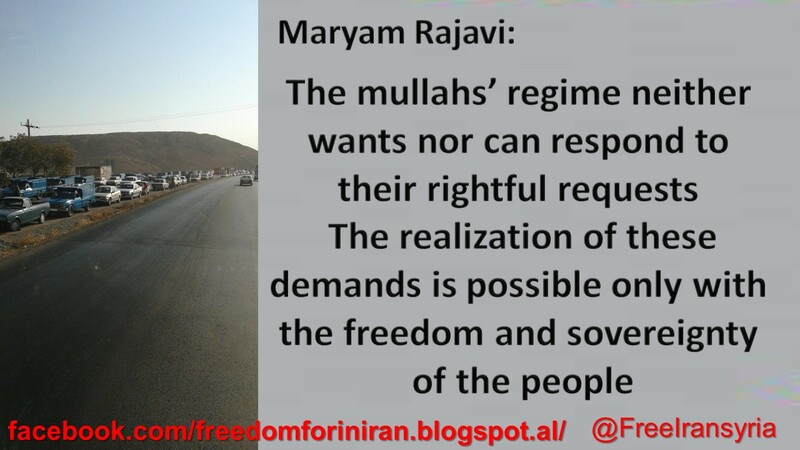 Maryam Rajavi, hailed the people staging strikes in Urmia, Kermanshah, Sanandaj, Mahabad, Saqqez, Baneh, Marivan, Oshnavieh, Paveh, Piranshahr, Sardasht, Bukan, Naghadeh, Javanrood, Kamyaran, Sarpol-e Zahab, Qasr-e Shirin, and Ghorveh. She also hailed all the people of the Iranian Kurdistan who have risen up in protest to the recent missile attacks and criminal executions. She once again called on the United Nations Security Council to stop the Iranian regime’s crimes against humanity. Authorities using Nazi/Hitler tactics, marking the stores on strike today as shop owners in 28 different cities across 3 provinces launched a general strike. To the world: Your silence supports the regime. Hundreds of retired teachers rallied on Tuesday outside the Iranian regime’s Majlis (parliament), protesting poor living conditions and not receiving answers to their demands. Retirees and Nursing pioneers staged a protest gathering in front of the Budget & Planning Oraganization office of the province, Teachers and retired educators also participated in this gathering. Truck drivers across various cities throughout Iran are on strike, protesting low wages and skyrocketing prices of spare parts. This is yet another round of such protests in Iran and has always delivered crushing blows to the mullahs’ apparatus. The fired workers of Darougar Factory, (one of the oldest hygienic material producers in Iran,) say their salaries is not paid and the factory shut down has not been pre announced and they are on the verge of unemployment. SANANDAJ, Iranian Kurdestan, Sep. 9, 2018. Protesting the Iranian regime in front of the Sanandaj courthouse a courageous woman chants: Death to Khamenei, Death to the Islamic Republic. TABRIZ, Iranian Azarbaijan. Sep.9, 2018. The youths writing: Death to Khamenei on the walls. Truck drivers across various cities throughout Iran are on strike, protesting low wages and skyrocketing prices of spare parts. 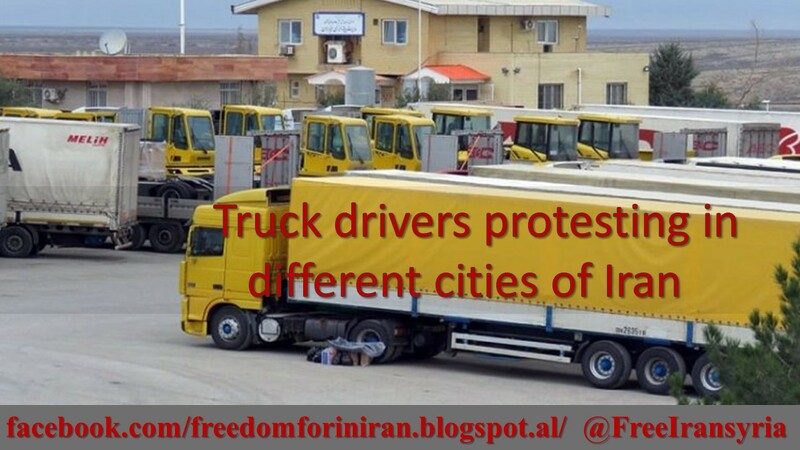 In Zarrinshahr a protest rally was held by the truckers who parked their vehicles at the loading station.